KATHERINE J. BECK NAPLES, FLA. – Private services were held at Green Haven Memorial Gardens for Katherine J. Beck, 97, formerly of Afton Avenue in Boardman. She passed away Tuesday morning in Naples. 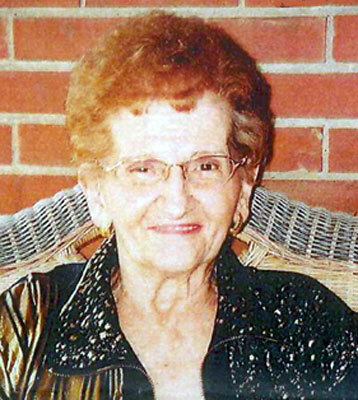 Mrs. Beck was born Sept. 15, 1915, in Little Falls, N.Y., a daughter of George and Josephine Darpini Pugliese. She was a homemaker and had one time been employed at Republic Rubber. She was a former member Our Lady of Mount Carmel Church. Her husband, Frank Beck, whom she married Jan. 30, 1947, died Jan. 16, 1994. Surviving her is a son, Chuck Beck of Naples; a daughter, Geraldine Siman of Boardman; and three grandchildren, C.J. Siman, Jamie Siman and Kamryn Beck. Preceding her in death besides her husband and parents are two brothers, Joseph and Frank Pugilese; and a sister, Pauline Summers. The family requests that material tributes take the form of contributions to Vitas Hospice, 4980 Tamiami Trail North, Suite 102, Naples, FL 34103. Visit www.beckerobits.com to send condolences. Arrangements handled by the Davis-Becker Funeral Home.